By Joseph Herron – After elite level trainer Robert Garcia’s Welterweight contender, Marcos “El Chino” Maidana, took care of business in spectacular fashion on September 15th at the MGM Grand Garden Arena, the coveted boxing coach took a short trip to the famed Thomas & Mack Center to take in Top Rank’s main event of the evening between Julio Cesar Chavez Jr. and Sergio “Maravilla” Martinez. Although the expert trainer initially predicted a big Chavez victory on Saturday night, Robert could see that the rumors out of Vegas were true concerning Junior’s lack of time spent in the gym. The former IBF Super Featherweight Champion is convinced that Chavez Junior’s cautious fight tactic was a product of his lackadaisical effort during preparation for the most important fight of his career. Every great trainer insists that prizefights are always won and lost in the gym. 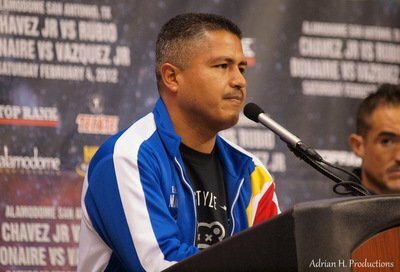 Robert Garcia sites Maidana’s impressive performance in stopping Jesus Soto Karass as a perfect example. The Oxnard, California resident claims that Chavez Jr. could learn a lesson in humility and professionalism from his hard punching Welterweight fighter. Next boxing news: Pacquiao vs. Marquez IV: is it just for the Money?